the musings and desires of a Bay Area interior designer....: Designing Furniture, it can be a nail biter. Designing a piece of furniture for a client can be a bit nerve wracking. I am constantly checking my details, dimensions and finishes. Like anything, the perfect image can exist in your head, but how will it translate to your furniture builder? And more importantly can you translate the vision to the client without the need to see it in 3-d before placing the order? Finding a furniture maker that you are comfortable with makes a huge difference. It takes a while to develop this relationship. But once he understands your style, preferences, etc.. it can be a great relationship! (now if only I could find a boyfriend that understands me, life would be perfect!!) I am really lucky to work with a guy that will take my concepts and bring them to life. I spend a couple of hours (at least) talking through my design, reviewing drawings and then go back and forth on finishes, dimensions and the fine details, down to the hardware. From concept to completion.. ready for delivery! This entry piece is designed for a client and will fit into a niche near the front door, below a window. The homes' interior design is modern meets craftsman-style. The drawers will serve as a place to store shoes, keys or anything else you may want to remember, without it looking like a huge pile by the front door. Several sources offer the opportunity to customize your furniture and lately I've seen lighting company's do the same. See Lighting Universe and their offer to design your own custom light fixture. Wouldn't it be great to have a really cool light fixture designed by you? 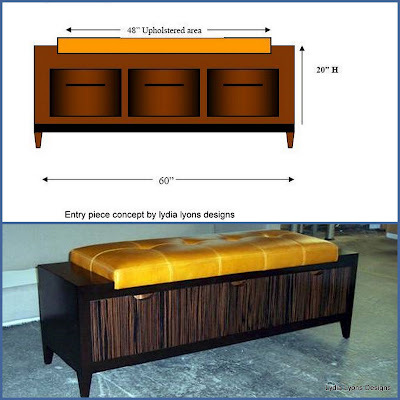 Any seasoned designer would want to develop relationship with a custom furniture maker. If nothing else, these pieces set design apart, and are useful, especially for unique clients.